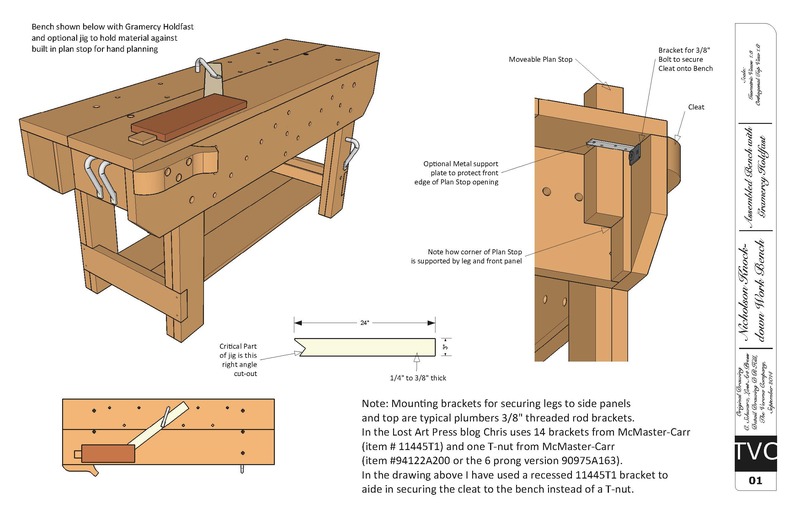 Thanks to woodworker Donna R. Hill, you can download a free SketchUp drawing – or a pdf version – of the knockdown workbench I built a couple of weeks ago. Here’s the video in case you missed it. Donna (some of you might know her as the “Wood Wench” through the Society of American Period Furniture Makers), produced a SketchUp file that she uploaded to the 3D Warehouse. You can download that file by going here. She also produced an excellent three-page pdf with complete measured drawings of the bench. Even if you have SketchUp, I recommend you snag these plans as well. Donna teaches SketchUp classes locally here in Cincinnati; so if you need some instruction in this program look her up. She’s also a frequent demonstrator at the Lie-Nielsen Hand Tool Event when it comes to Cincinnati. She’s a talented woodworker – and expect to see more of her illustration work in upcoming Lost Art Press books. This entry was posted in Downloads, Workbenches. Bookmark the permalink. Not to nit-pick, but I see a spelling error in the PDF. I believe the term ‘Plan Stop’ was used in place of ‘Plane Stop’. Or am I missing the correct terminology? I’m glad I’m not crazy then. And thank you for doing this Donna. People helping people is the best way to be. I couldn’t wait for your plans, so I built one based on your previous posts and your video. My measurements aren’t the same as in your plan, but they are close. I assembled the legs and side panels yesterday, and I am extremely impressed with the dead rock solidity of the base. Your design of the leg assemblies is pure genius! I had the left side of my bench extend 8″ past the leg assembly (vs. the 6.5″ in your plan) so I could make the crochet clear the left top side mounting bolt. I plan to add dog holes in the left front leg, as well as one dog hole between the upper and lower mounting plates on the left front. The top and side panels extend 11″ past the leg assembly on the right, to accommodate a possible future tail vise. (I may never add a tail vise, or I may add a Lee Valley inset vise, or some other vise. The inset vise needs at least 10.75″ to accommodate its clean out hole.) Total length of my bench is 6 feet, 4 inches (or 76 inches long). My bench is made of Douglas Fir, and I have a piece of Jatoba that I plan to use for the planing stop and crochet. Today I will be gluing the top together, and using my winding sticks and plane(s) to prepare the base for the top. Thank you for your recent attention to the Nicholson bench, including the “Naked Woodworker” videos. The “Naked Woodworker” videos provided invaluable knowledge and inspiration, and your “knockdown” design approaches perfection for the Nicholson style bench. Robert, just be careful about where the hardware that you are using to hold the crochet to the bench comes thru (my grandfather always called it a cleat so I keep reverting back to that term instead of crochet – old habits!). In this drawing the plane stop rides against the front panel of the leg and the little board on the back side of the panel. In this configuration the plane stop is less prone to “racking” when excessive force is applied to it from the front or from right to left (like when you are planing a board). If the hardware isn’t recessed it could act as an obstacle when trying to move the plane stop up and down. Crochet is a method for producing textiles. The term for the projection on a woodbench is croche from the French, la croche, meaning hook. A few months ago I bought the DVD Build a Sturdy Workbench in Two Days. Now I’m wondering what to build to serve me effectively in the coming years, workbench shown on DVD, or Nicholson workbench? Both benches will handle typical workshop tasks with ease. Pick the one that suits your eye or the tools you have available to build it. Here’s another persnickety comment… I find the notched stick works better when it passes by the holdfast on the other side of the shaft. The tendency for the stick to rotate is stopped when the stick cams into the holdfast shaft. Ok, now I’m just disappointed in you guys! None of you have commented yet on the “woods crews” in place of “wood screws” on page 2. You guys are slipping! Many thanks Donna and Chris! Oh, and Mike Siemsen’s Naked Woodworker DVD is also inspiring. Thanks to Mike and the Lost Art Press Club for that one (sorry, couldn’t resist the lame journo joke). Something else I noticed. Did Chris finally get a wood stretcher or is there a miscue in the top measurements? One board is 10.5 inches wide, the other is 12 inches. Correct me if I’m wrong, but the average 2×12 is more like a 1.5×11.5. I can adjust on the fly, but someone working right from the drawings is gonna go crazy looking for a 16 inch board to cut down. And thanks Donna for the great drawings! A standard whatever-by-12 is 11-1/4″ wide, so I think the idea is that you use two of them at full width, cleaning up the inside edges just enough to get a good joint.